Sargent’s Daughters is pleased to present Where The Fire Started, an exhibition of paintings by New York based artist Brandi Twilley. 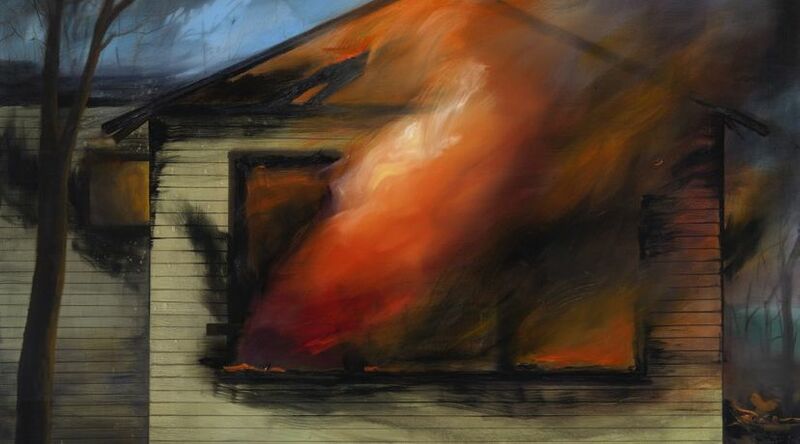 In this series of paintings, Twilley returns to the bedroom of her childhood home, which was destroyed by a fire in 1999. Before the house burned down she made pastel drawings of the bedroom from life that were then lost in the fire. In the year following the fire while her memory was still lucid, Twilley made a series of 16 by 20 inch paintings of the bedroom. Those paintings became her only primary source for the current large-scale paintings since there were no surviving photos of the room, and her 16 year old self became her collaborator. Details such as the cracks in the ceiling plaster, the trees visible through the window and the Picasso reproductions torn from a calendar are specific memories rooted in direct observation. In the bedroom paintings we are immersed in the atmosphere of the house’s decay in the year preceding the fire. The roof is dilapidated and rain soaks the room. A blue plastic tarp, which Twilley slept under during heavy storms, is crumpled on the bed. In “Cat in the Roof,” blood drips down the wall, catching on the warped curves of the paneling above the fireplace. A stray cat and her kittens had been living in the roof above the fireplace and had died, causing maggots to rain down into the fire. In “Plane Crash Survivors” we see, tacked up on the wall, one of Twilley’s first paintings, inspired by a dream of survivors of a plane crash helping each other to reassemble severed body parts. Twilley drew herself standing in front of her bedroom mirror to make studies for the figures and used National Geographics as a reference for the landscape. Picasso’s Blue Period painting “La Vie” was her color reference. When the fire started Twilley was at school and had with her library books on Picasso and Titian. These books, which she was allowed to keep, ended up being the only remaining items from before the fire. She made copies from their reproductions and they became well-worn paint smudged manuals for learning to paint. The paintings of the library books are done from life, with Twilley painting them propped on her easel. The bedroom was where the fire that destroyed Twilley’s childhood home began, but it was also where Twilley first nurtured her own internal fire, one that sustained instead of consumed.